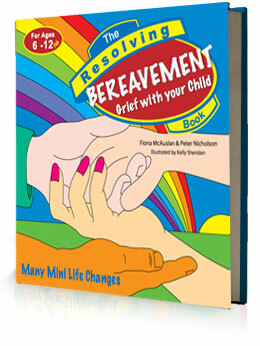 About the Resolving Bereavement Grief with your Child Book. Death is something we all must experience as a part of live, even children. This book helps children to deal with the acute loss and strong emotions that result from the death of a loved one. The story focuses on how loss affects Joe and Lisa in different ways, but also how they both find support and learn how to talk about their feelings. They begin to regain confidence and learn how to be happy again. “A wonderful, child-friendly book that handles difficult and painful issue sin a way that will make it really helpful to children and parents.” CEO, Barnardos Childrens Charity.